This month Great Sites launched Watch & Win a smart way for advertisers to engage with consumers using TVCs or other video assets. Great Sites offers an end to end solution or can integrate with the advertisers own promotion. Members of the Great Site portal are invited to view the advertisers video via site promotions and email. 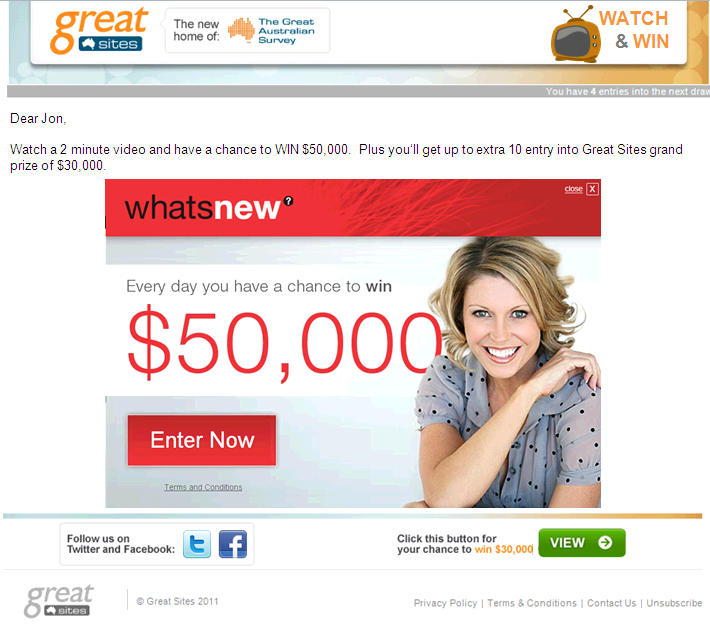 After they view the TVC or video, members are rewarded with entries into Great Sites grand prize of $30,000. The incentive can be further extended via the advertiers own prize or promotion if they wish. The member watches a video for a defined period time before a question is displayed about the content of the video. The format and function of these questions is flexible and can be customised in a number of ways to ensure the member is fully engaged with the advertisers video. This promotes recall and recognition of the advertisers message. Once the question is answered the member can then be redirected to the advertisers site or an entry form for the advertisers own promotion. Co-registration can also be added at this point to automatically pass the users contact information onto the advertisers, which requires an opt-in question to be asked by the advertiser. To find out more about Watch & Win contact 3di.